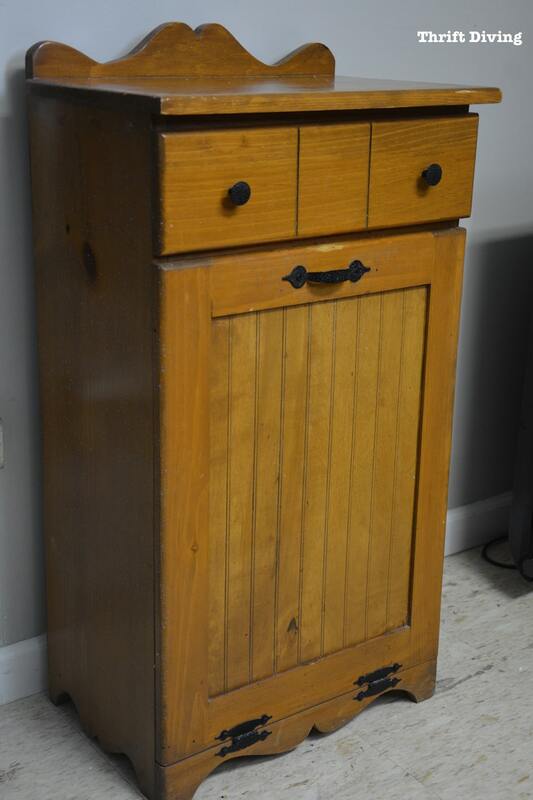 If you were to ask me what was the nastiest furniture makeover I’ve ever done, this wooden trash can bin from the thrift store would take the prize. Sure….the outside of the trash bin looked pretty innocuous. 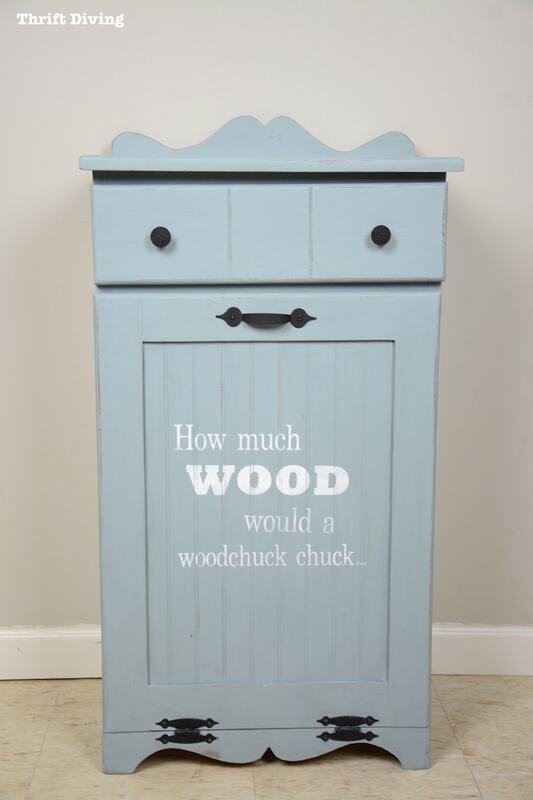 But it’s a wooden trash can, after all…. One shouldn’t be surprised that it looked like this inside when you opened the door. 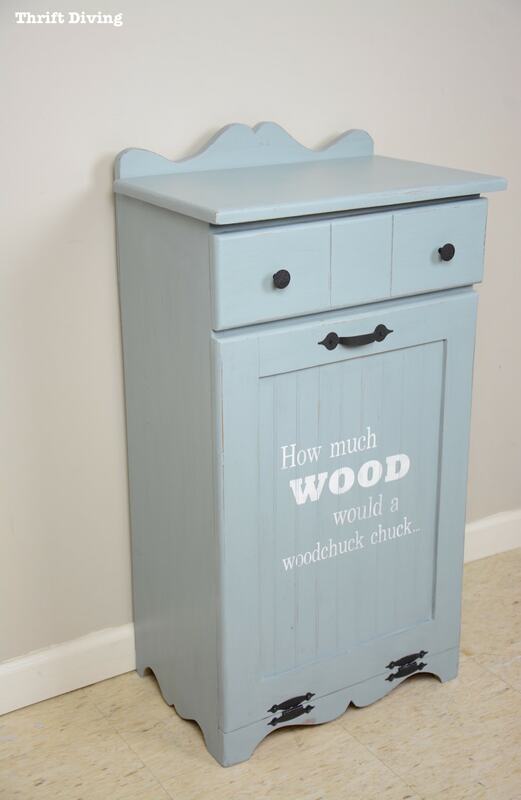 I had bought it nearly two years ago (when I was hoping to convert it into a laundry cabinet for my boys’ bathroom makeover. But like all the other furniture, it sat. Until finally I decluttered my garage recently. Something about that massive donation to the thrift store sparked a flame to start tackling some of those projects. Maybe because now the sense of overwhelm was gone and there were fewer options of projects from which to pick. But it was time to make this baby over! 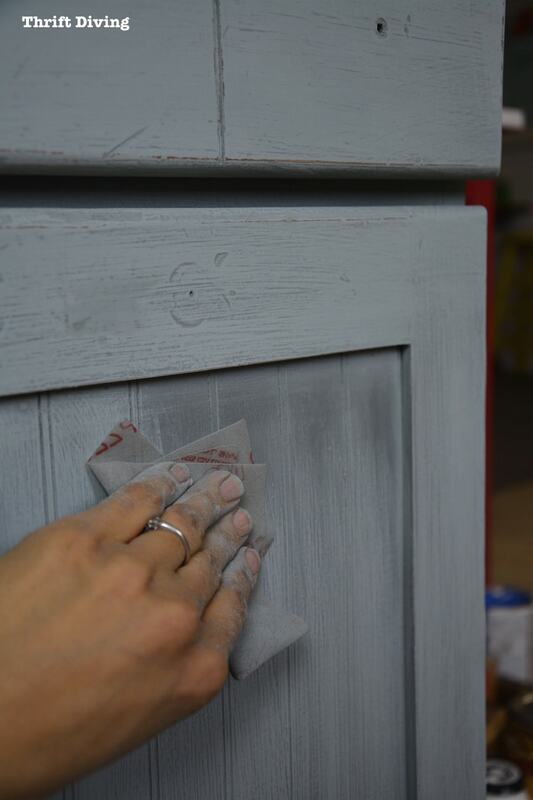 Most furniture won’t need to be primed (as long as it’s already smooth and not bleeding through. 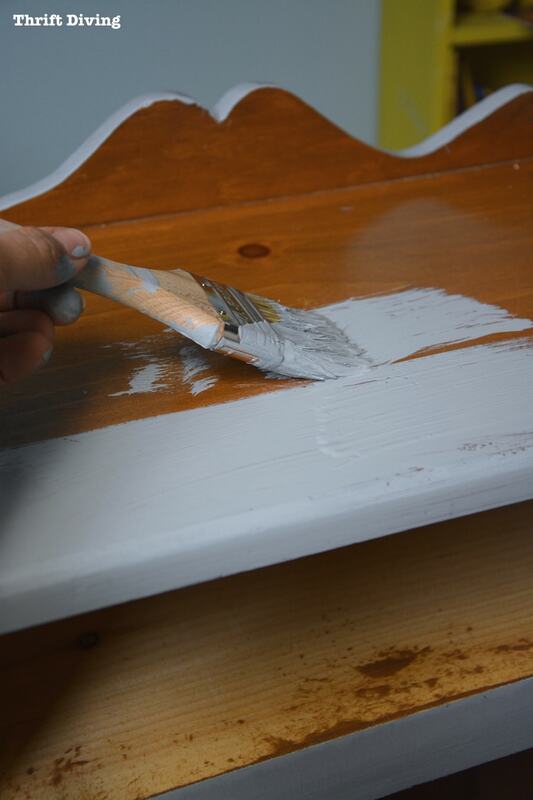 If it does bleed through, cover it with a coat of Kilz Oil-Based Primer). But it definitely should be wiped down before you start painting. I tend to stick with Simple Green to clean and de-grease. 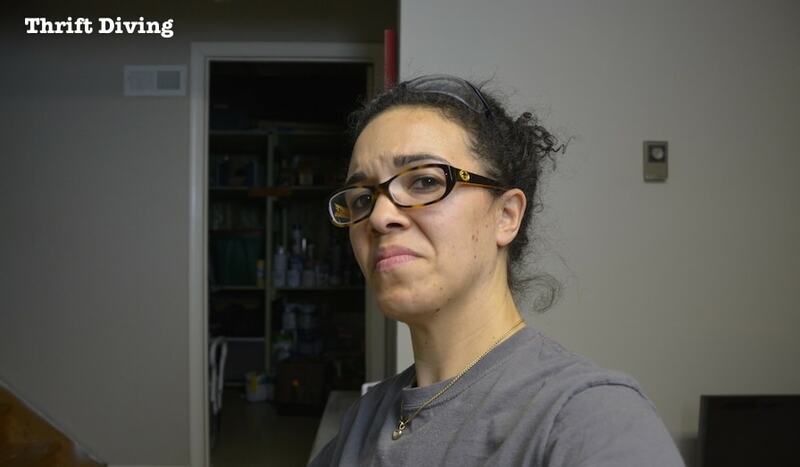 Oh, oh, but can I show you how disgusted I was with this project??? I don’t care how much degreasing you try to do, ain’t nuthin’ totally removing the nastiness inside this wooden trash bin! That’s probably some family’s 15-years-worth of food particles in there! That’s when I realized there was no way in heck this thing was going into my house. Not even for my recyclables or dirty laundry. This thing was going out into my garage for storing scrap wood –right where it belongs! So I decided to try to SAND OUT the gunk, so I could at least paint the inside BLACK to help hid the gunk, which left me making the ugliest face. I just couldn’t stop making this face. But can’t you see why, though?? I feel sick just looking at it. Feel free to keep swipin’ and scrollin’ along! 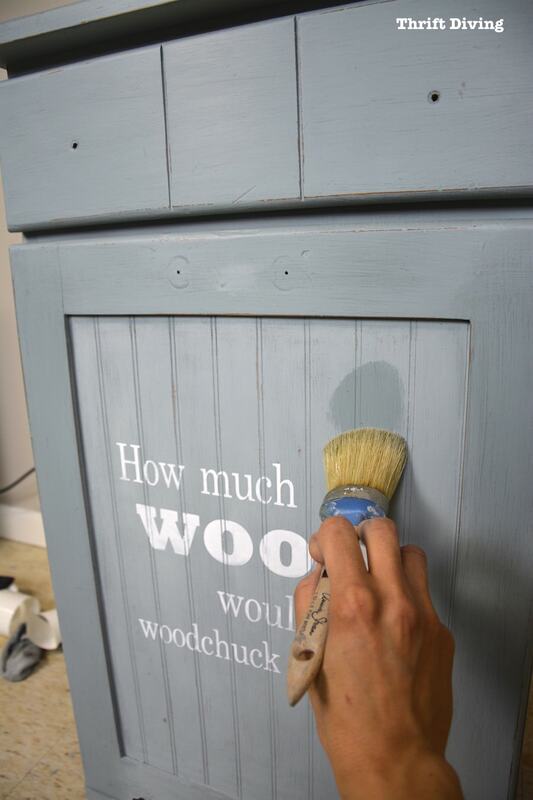 What’s the Best Paint For a Wooden Trash Can? 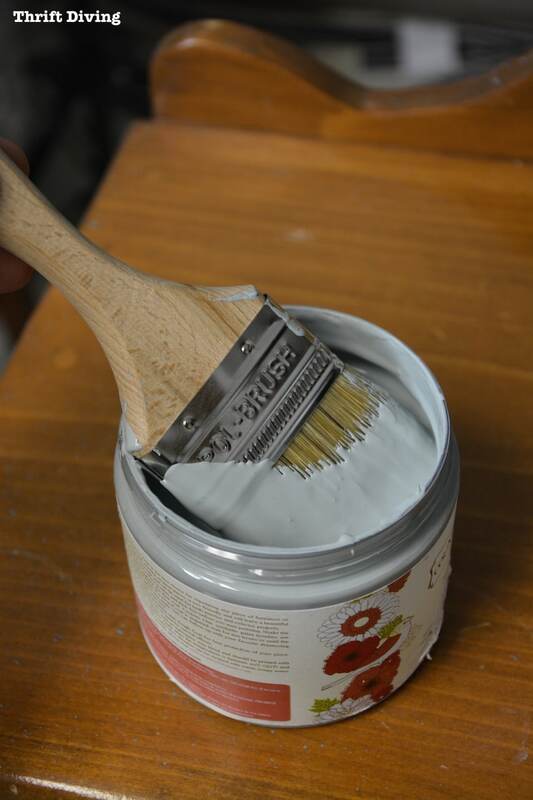 I wrote a post on the 12 best paints to use for furniture, and one brand I left off that list was Country Chic Paint. I had never used it–had never really even heard of it. Well, nothing is free, but since I’m supposed to be “in-the-know” about all these different products and how well they do or don’t work, I agreed to try it out to see how it stacks up again other furniture paint. At least I wouldn’t have to pay for it out of pocket (#brightside!!). 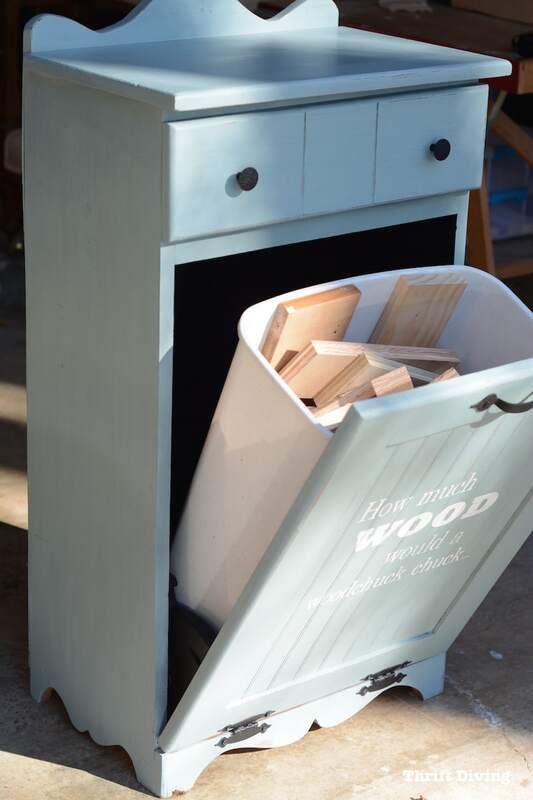 And this wooden trash can was the perfect small project to test it out! I normally use Purdy paint brushes because they’re synthetic and so smooth and I tend to love modern finishes without a lot of brush strokes. But this time, I used some chip brushes with natural bristles lying around in my supplies and decided to use it. The bristles left some texture behind in the brush strokes, which later ended up being a good thing! A little spotty, but not unusual with 1 coat of paint. 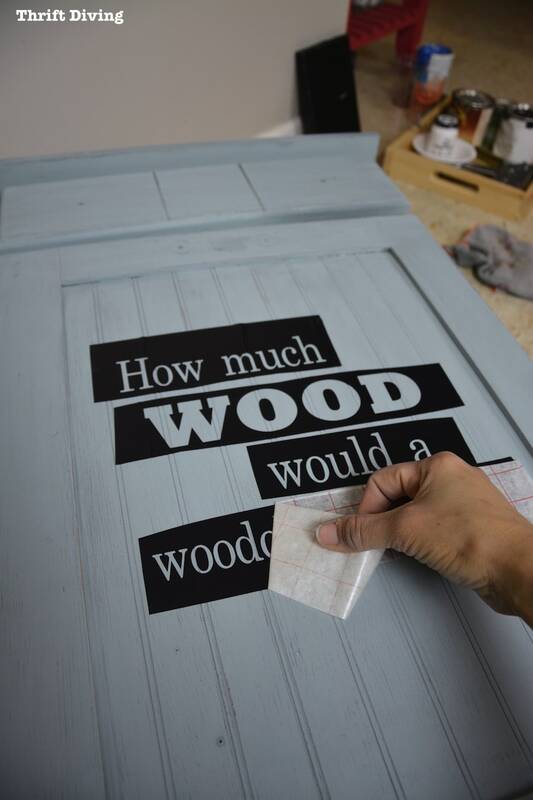 Most paints require 2 coats. 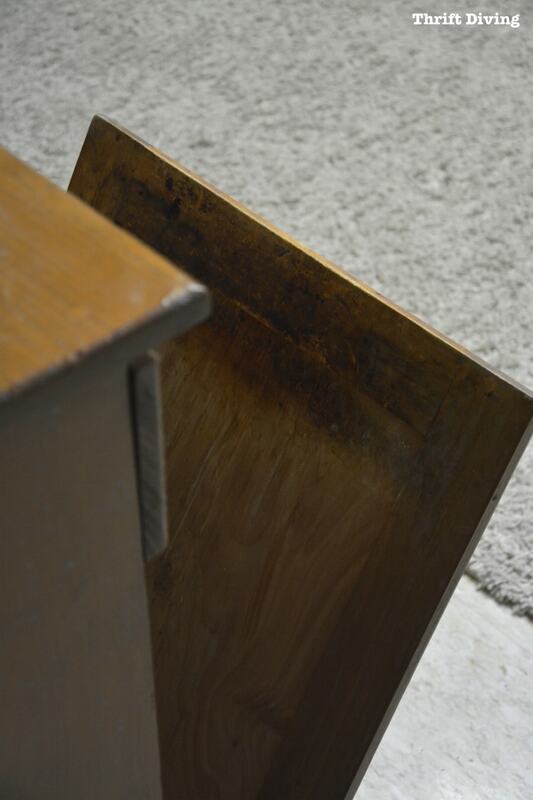 It’s no secret that steel wool can be used to distress furniture. 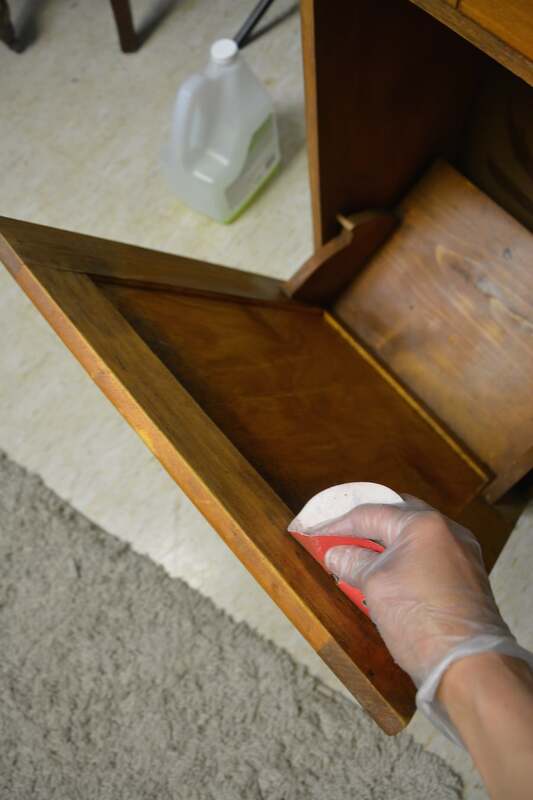 Heck, you can distress furniture with sandpaper and vinegar, too. 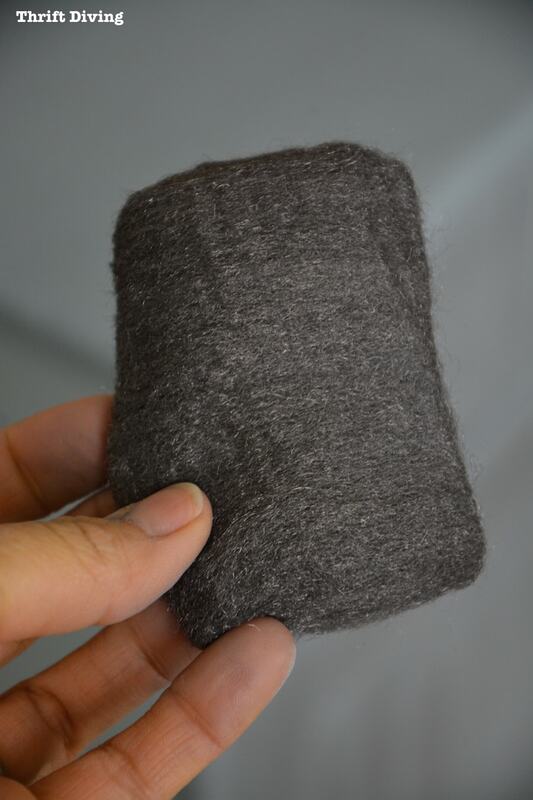 I have a bunch of steel wool lying around, although I’d never really used it. 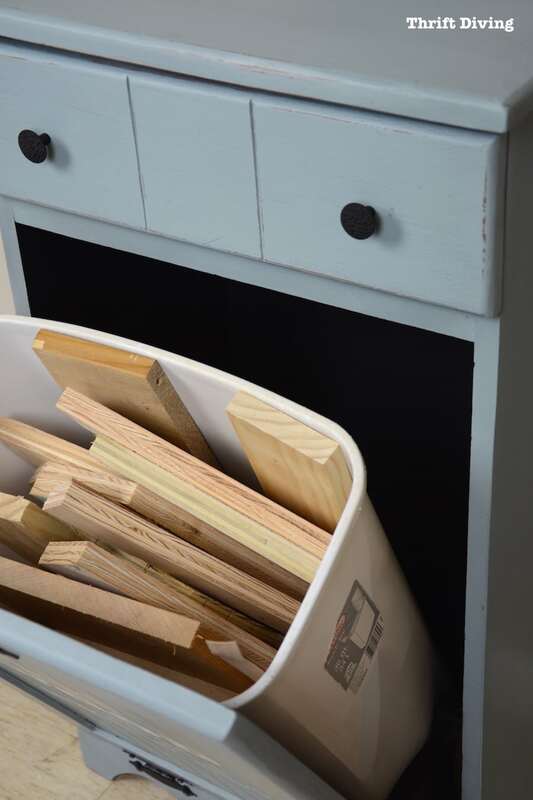 But it worked so well on my mid-century modern chair makeover (the one I almost ruined, LOL), I decided to see how it worked on this wooden trash bin makeover. As I rubbed the steel wool over the blue paint, it started to turn gray. At first, I was a little horrified, thinking I was going to have to re-paint the whole thing. But I was curious what would happen if I kept going. 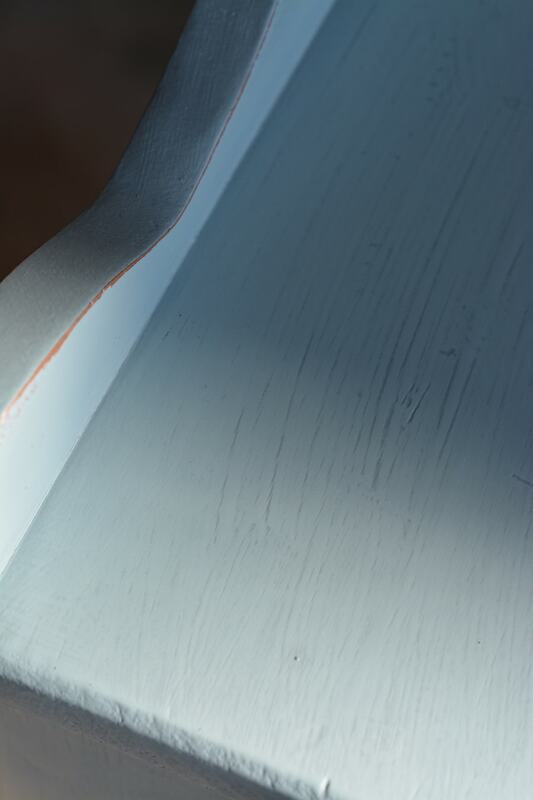 But then the most awesome thing happened: when I took 220 grit sandpaper to the grayed areas, it removed the top layer of gray while leaving some of the gray settled into the paintbrush strokes! 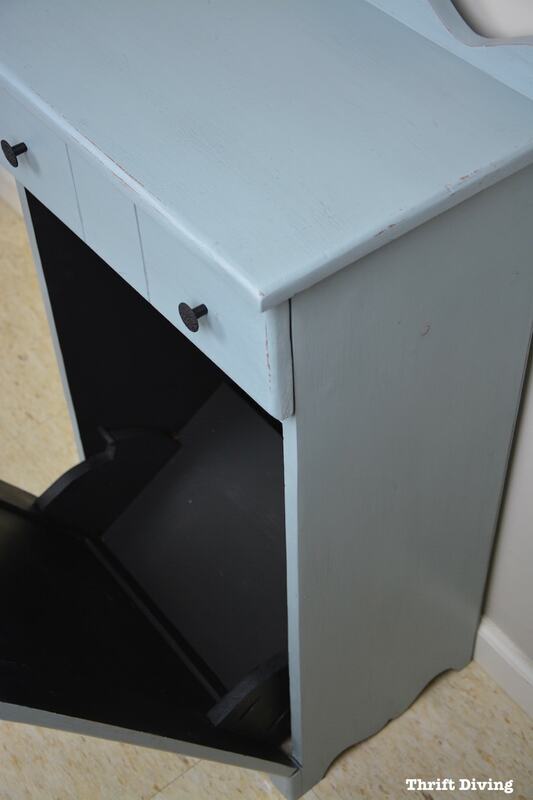 I’m generally not a distressed-furniture kind of chick, but knowing that this was going into my garage, a modern finish was too….perfect. It needed to be a little “dirty” and distressed. I admit that it was super messy, so I had to wear a dust mask because those little particles were floating everywhere–I even had them in my hair! But I had texture! I realized that it was a great way to distress furniture without having to spend money on antiquing wax!! 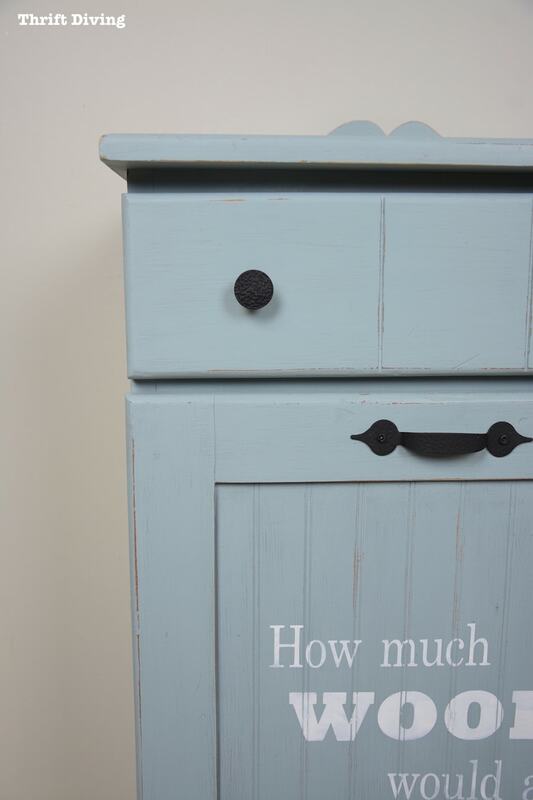 I love, love, love stencils! I use ready-made stencils, but some of my favorites I cut with my Silhouette Cameo. 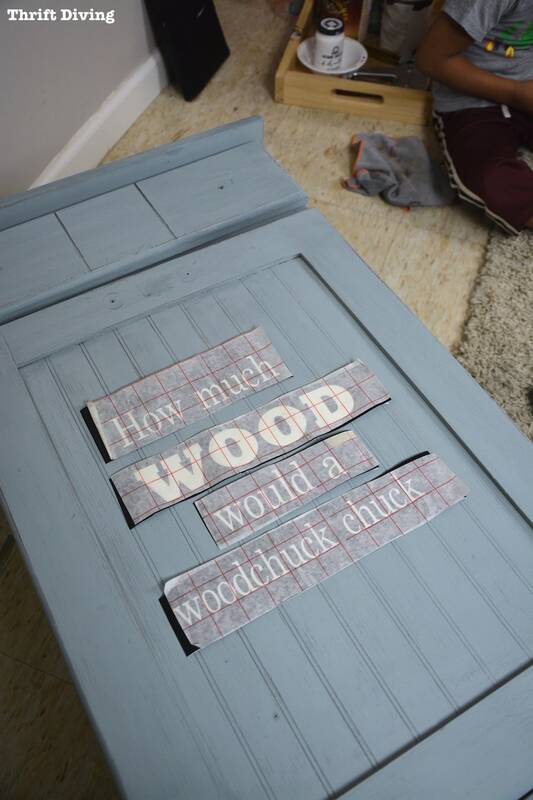 I used vinyl to cut out a stencil that says, “How much WOOD would a woodchuck chuck…” and used transfer paper to apply it. 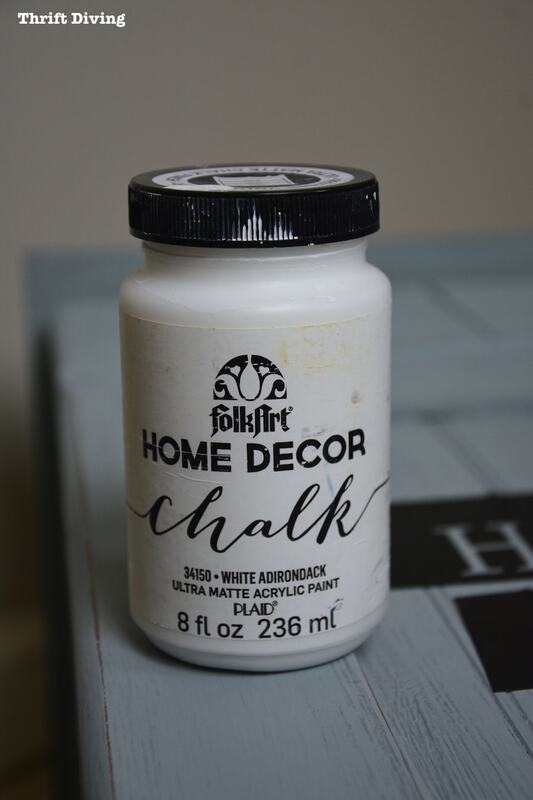 One of my favorite brands of paint is FolkArt Home Decor chalk paint. 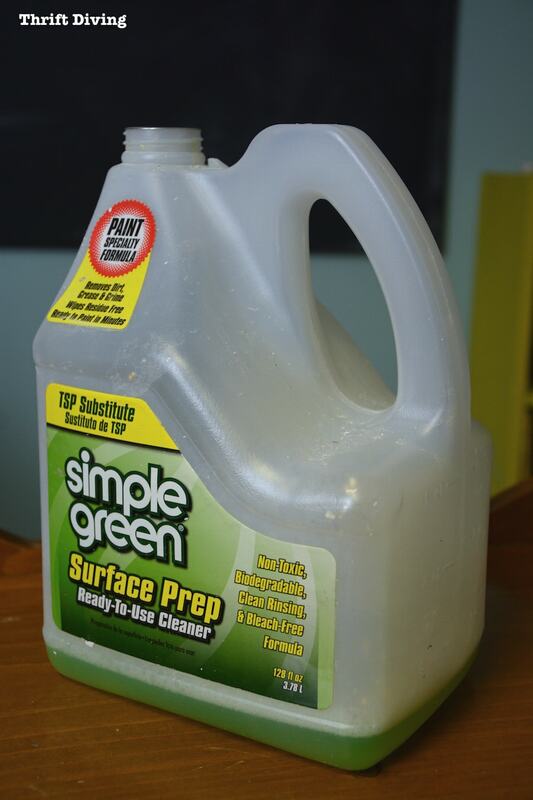 That stuff sticks so well, and you can buy it in smaller amounts from Amazon for cheaper than some of the more well-known brands of paint. I dabbed a foam brush in and added two thin coats over the stencil. 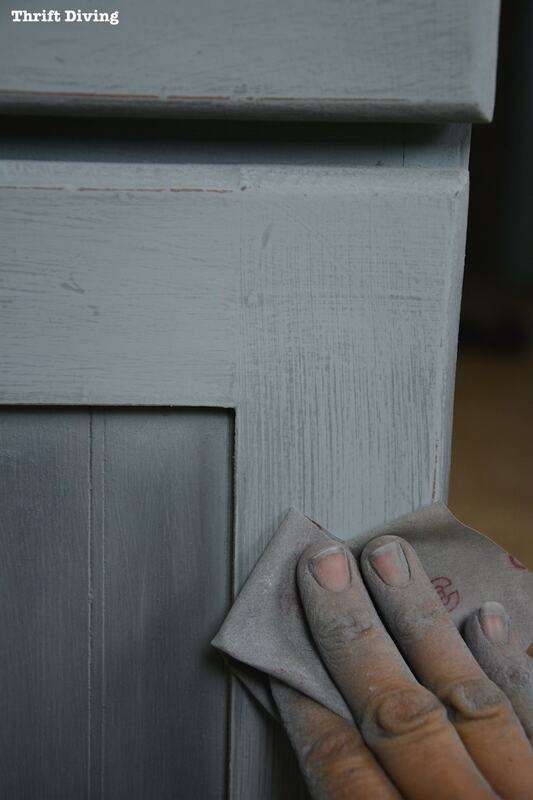 When it dried, I ran the sandpaper over it to smooth it out and make it look not-so-perfect. 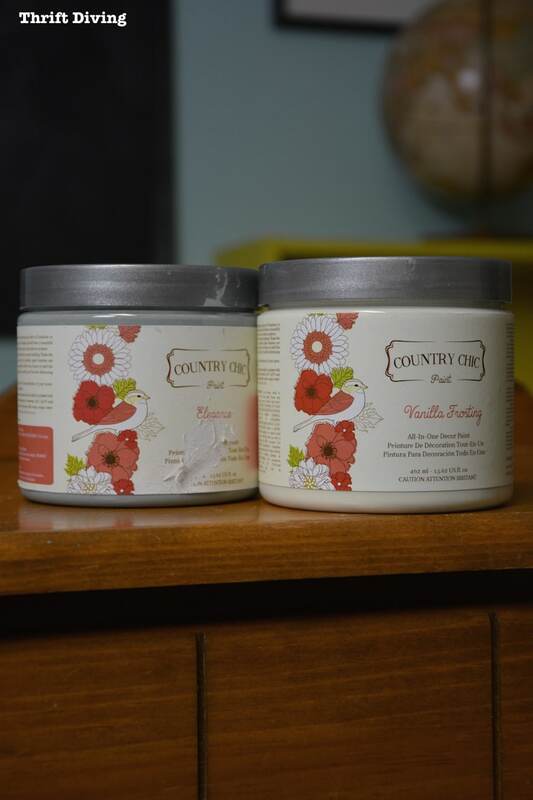 Oh, man, I loved the Country Chic natural wax! It had absolutely no smell (versus the other stinky wax I used recently). One of my favorite parts of waxing is seeing the color deepening. Don’t you love that, too?? And after all that sanding, with a light coat of wax (buffed with a lint-free cloth)–my goodness…..
…it looked great and felt soooo smooth! It got a nice, thick coat of black to disguise the GUNK. When you look closely, you can see the aging of the steel wool in the paint! It’s perfect for holding pieces of scrap wood in my awesome garage workshop. Now I just need to focus on the next big project: Operation Garage Workshop! And this piece will be perfect for it. 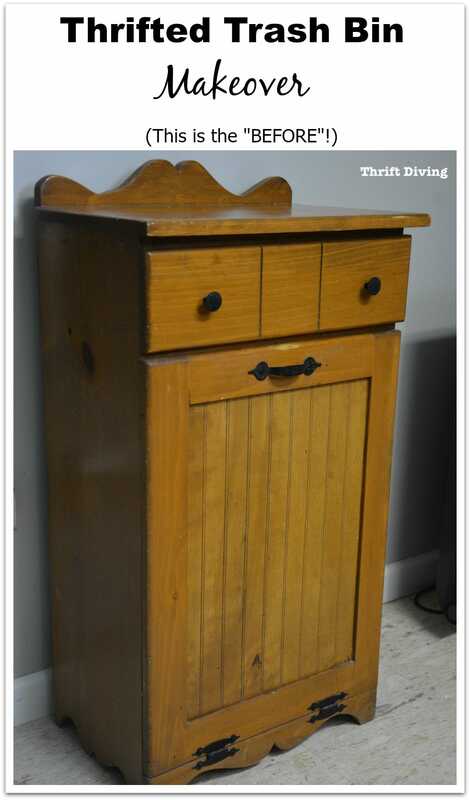 So how do you like this wooden trash can makeover? Leave a comment and let’s chat about it! Fantastic makeover! And it’s perfect for scrap wood! The inside would have grossed me out too…black paint to the rescue! Cute saying. I’m still figuring out my Silhouette- I need to try a stencil. Thanks for the inspiration! Hey there, Cecilia! Glad you like it! Have you watched some YouTube videos to learn to use your Silhouette? 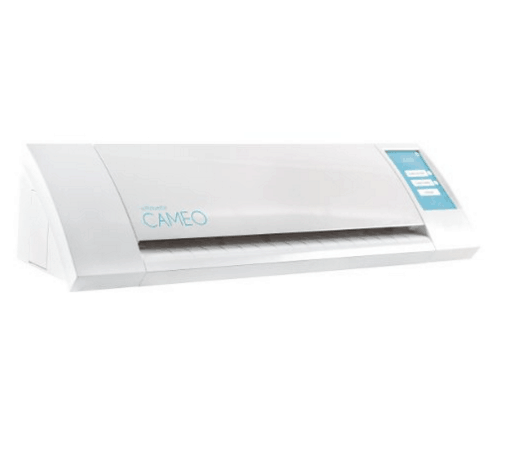 I haven’t used it for nearly ANYTHING except for vinyl stencils! So many things you can do! Great project. Love things that look good and organize. Serena, I’d love to vote for you. I think you deserve to win. But when I tried to vote I was taken to social media. Sorry, but I don’t belong to any of those. If there’s a straightforward way to click and vote, I’ll be plesed to do it. You continue to amaze and inspire, Serena. This turned out really well and what a clever slogan for the exterior. I have a Silhouette but need to figure out a software issue. Suddenly it has a mind of it’s own when cutting. I voted for you yesterday and also shared on Facebook and Twitter. Awww…thanks, Alys! 🙂 Did you figure out your software issue? Can you uninstall it and reinstall the software? Hi Serena, I am so proud that you got nominated for this TV show. I think you will be prefect for it. YES – I voted for you . I also think you did a terrific job on the yukky garbage bin. not wanting it in your home. 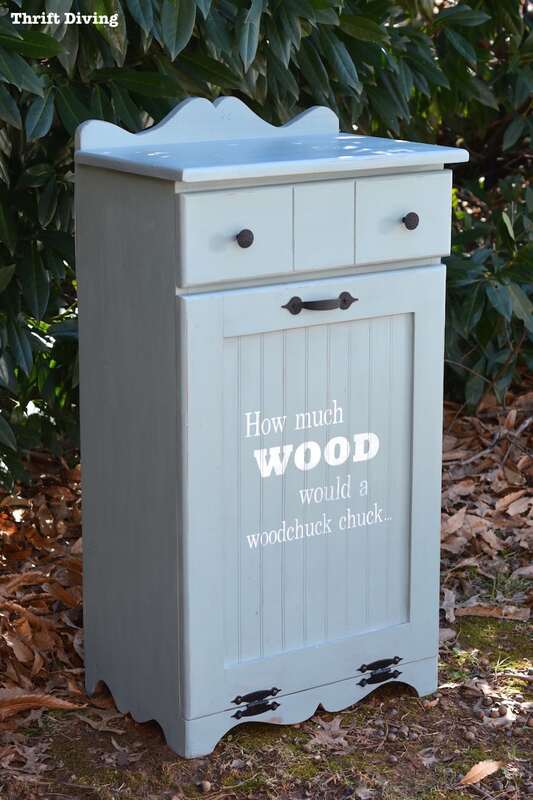 Looks good as a wood bin. I wish it were a TV show! 🙂 It was actually a speaking contract for to speak at 4 home shows in the fall! But you never know, maybe a TV producer will be there and see me and–VOILA!–I’d be a star! LOL. 🙂 Thanks for voting for me!! You are so clever! Who would have thought to make that thing into a scrap wood holder?!? It turned out great, and I voted for you! Sure hope you win! Hi, Marilynn! What’s so funny is that I usually have a THEME every month or so…And right now, my “theme” is garage, so every project I do I try to make it related to what I’m working on. So it seemed like a good idea! 🙂 Anywhere to hide that stuff away so it’s not just sitting all over the corner, looking messy! 🙂 Thanks, Marilynn! good job! i voted for you and as we say in NJ, vote early and often! Serena! You are definitely the best as far as those videos go! Your voice is distinctive and so is your style. Good Luck! It would help if you would re-post the link to vote every day so we can get to it easily! 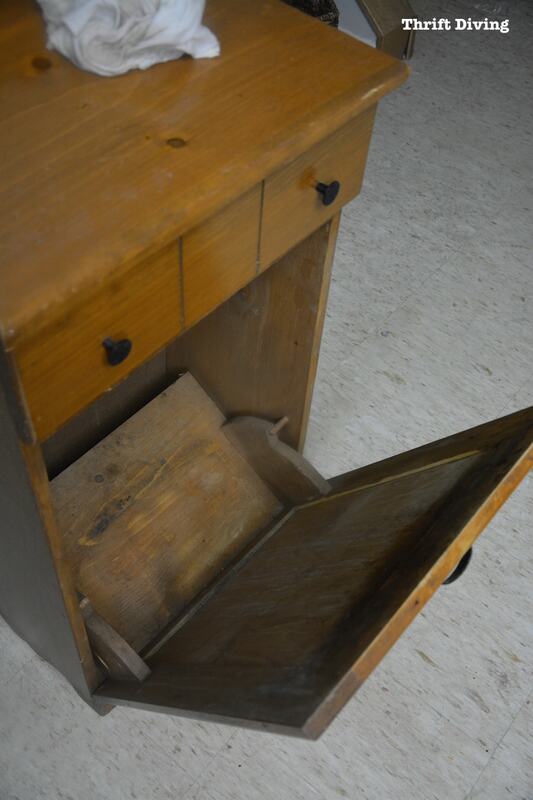 About the crud in the woodchuck bin – I had a really disgusting cabinet with racoon poo in it (they had wintered in my mom’s shed and used the base of this cabinet as home). Yeah, disgusting. But anything can be cleaned (and sanded and cleaned again and again) and then painted. The cabinet is now in my guest room and I don’t even THINK of racoons when I look at it. Well, not too much. Gretchen, LOL! Wow, racoon poo? I love how you say, “I don’t even THINK of racoons when I look at it. Well, not too much.” 🙂 You should totally get a racoon figuring just to honor it! HAHAHA. Just kidding! But you’re right, paint and suds can do wonders! Glad you were able to save it! Most people would have been like, “Nope, it’s going to the trash!” Way to save it! Hi! I really like what happened to the trash bin. Perfect for the garage. I enjoy your blog also. Awww….thank you, Sandi! I can’t wait to get it into the garage and set up for use! 🙂 Glad you like my blog, too. That’s awesome! Hey Serena, you did it again! I love how that turned out! Painting the inside black was a very, very, very good idea!! 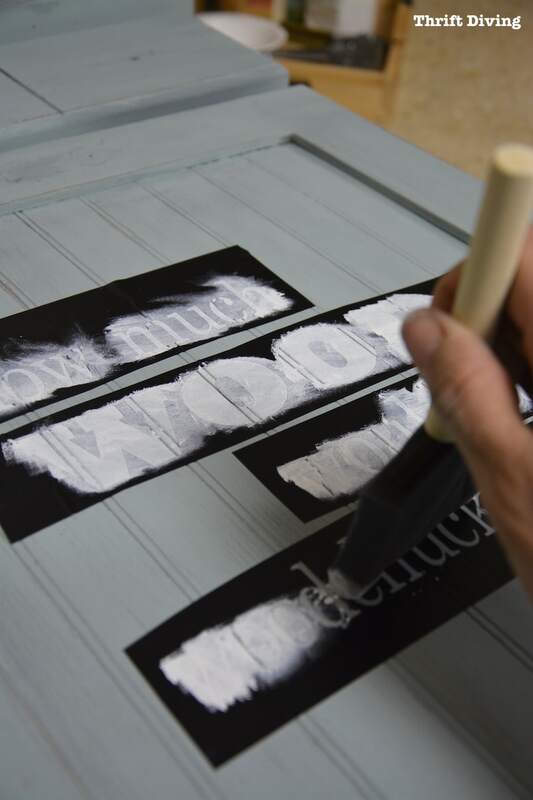 I’d even put a coat of clear acrylic spray sealer over the black!! That’s just me though… OCD! hahaha Thanks for sharing. 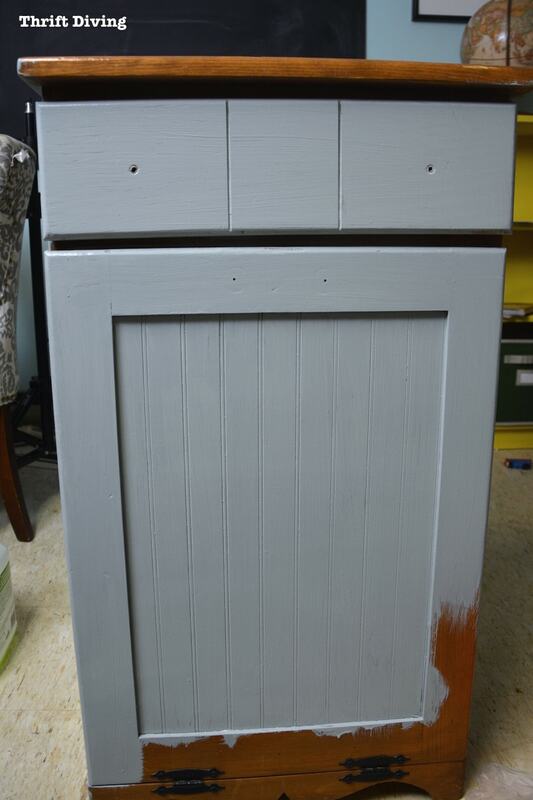 great little cupboard redo! love the effect of the steel wool. cleaned up nicely! and I voted! You would be perfect for this opportunity! I hope she wins by a landslide!! !